With over 138 million collection objects, 2.1 million library volumes, and 137,000 cubic feet of archives, the stories of how our collections have made their way to the Smithsonian are almost as varied as the collections themselves. From a tiny mosquito to a space shuttle, we’ve seen, and moved, it all. This is an ode to all the collectors and movers that have made the Smithsonian what it is today. 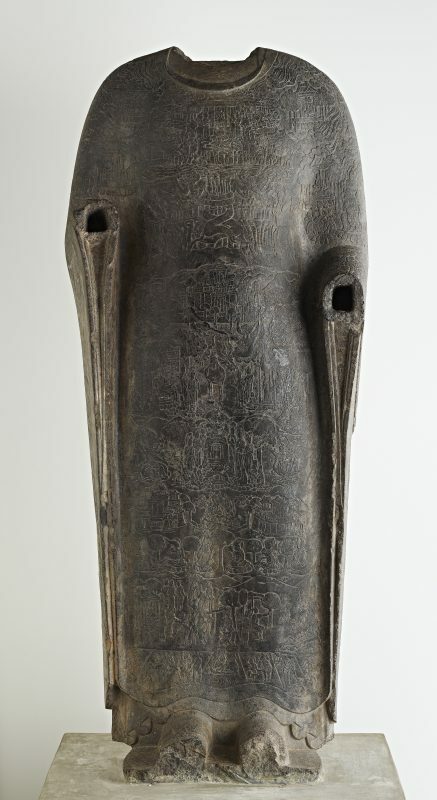 Due to China’s political unrest in the 1920s-30s, the Freer Gallery’s associate curator of archaeology, Carl Whiting Bishop, had to stop his excavations on archaeological sites in the Shanxi Province. Instead, he kept busy improving his Chinese and searching for artifacts to add the Freer’s new building. One such addition was a headless stone Buddha purchased for 4,800 Mexican silver dollars that continues to tell stories today. Buddha draped in robes portraying the Realms of Existence, Freer Gallery of Art, Purchase – Charles Lang Freer Endowment, F1923.15. In 1946 under the name Operation Crossroads, the U.S. government exploded two atomic bombs at the Bikini Atoll. Two Smithsonian scientists were assigned to the mission to evaluate the environmental impact of the atomic bombs. To assess the risk of radiation to humans, government employees placed several animals on ships near the island. The lone survivor, Pig 311, was found swimming for shore. In 1949, the Smithsonian was once again reminded of Operation Crossroads when Pig 311 was sent to the National Zoo to live out the rest of her days. 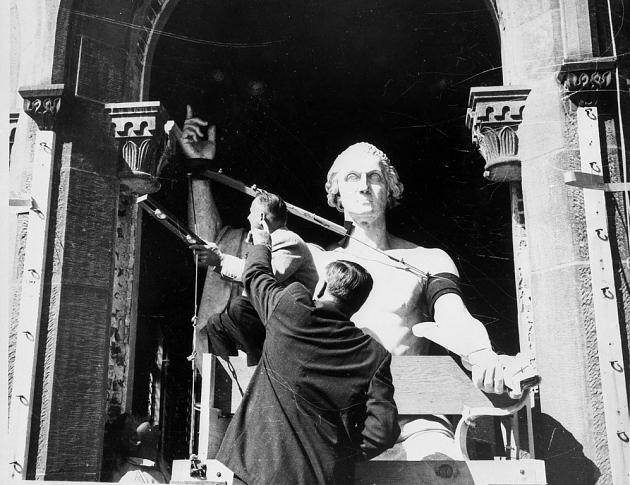 On September 6, 1962, the Horatio Greenough statue of George Washington was moved from the Smithsonian’s Castle to the partially complete Museum of History and Technology (now the National Museum of American History) in order to fit it inside before finishing the walls. While the distance between the two buildings is less than a half-mile, it took a lot of work–so much so that it remains there today! 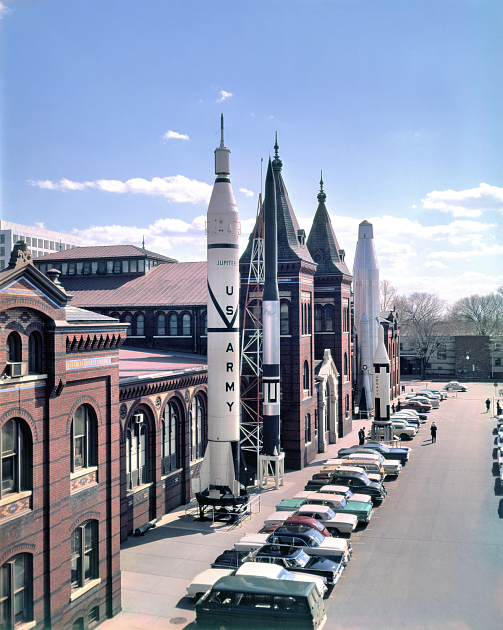 Perhaps alarming to some visitors, the Smithsonian displayed rockets outside its Arts & Industries Building (1950s-1974) before our National Air and Space Museum (NASM) was built. 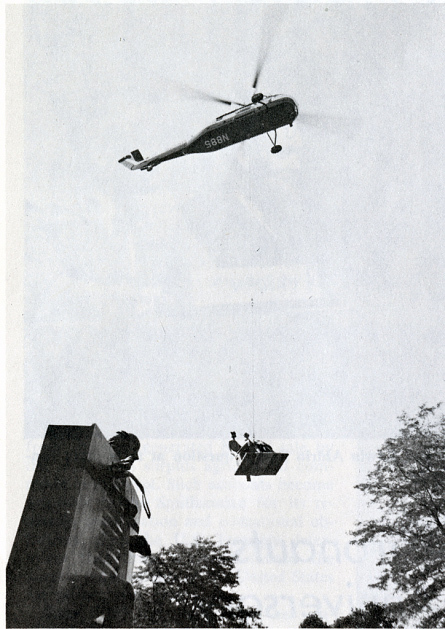 The rockets came down in November 1974 and into the new museum, but many people have fond memories of this eye-catching attraction on the National Mall. 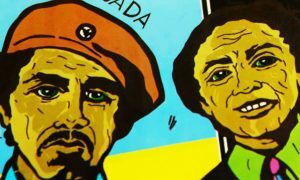 The Smithsonian’s Anacostia Community Museum resides in Washington D.C.’s historic African American neighborhood, and seeks to enhance understanding of contemporary urban issues both locally and across the country. 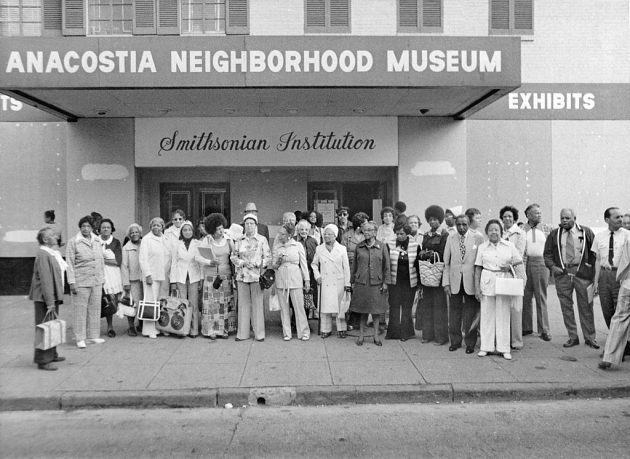 Their Community Documentation Initiative makes historic data and materials available to the community, and it includes a large trove of oral histories that bring this important neighborhood to life. 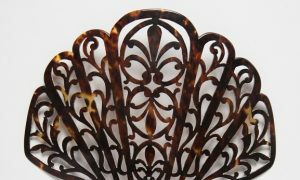 There are descriptions for over 160 of them online. 9. Make it two Renwicks! Not satisfied with just one Renwick building (our Castle), we acquired our second in 1966. Originally built to show Europe that America was sophisticated enough to have art (and to house the art collection of native-Washingtonian and banker William Wilson Corcoran), it was the first building built in America expressly for the display of art. In the 1950s, as it became increasingly dilapidated, Congress recommended razing the “Victorian horror.” However, First Lady Jacqueline Kennedy recognized its charms and launched a successful campaign to save it. In 1965, we asked to take over the building and Smithsonian American Art Gallery’s Renwick Gallery of contemporary craft and decorative art was born. Exterior of Renwick Gallery (19th c.), by Jarvis, J. F, c. 1880’s, Smithsonian Archives – History Div, SIA2011-1138 or SIA2008-2350 or 95-1169. 10. The sky is falling! Wait, is that a statue? 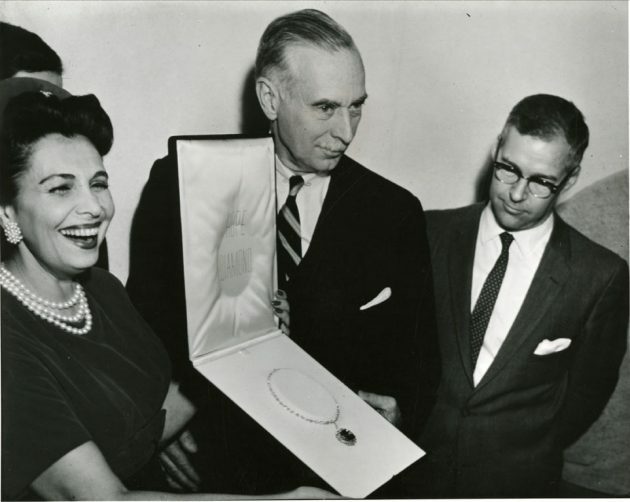 When Joseph Hirshhorn gave in to the persistent wooing of President Lyndon Johnston and his wife, Lady Bird, and Smithsonian’s then Secretary, S. Dillon Ripley, he agreed to donate his collection in 1966 to found a national museum of contemporary art. The question then became how to move the over 12,000 artworks, including rather large sculptures, from his home in Greenwich, Connecticut, to the National Mall in Washington D.C.? One word: helicopter. “King and Queen” Transported from the Hirshhorn Home, by Unknown, August 5, 1974, Smithsonian Archives – History Div, SIA2011-2397. 11. It’s a bird, it’s a plane, it’s a space shuttle?! Not to be outdone by the Hirshhorn sculpture helicopter drop, NASM’s Udvar Hazy Center near Dulles Airport received the Space Shuttle Discovery in 2012 after it flew across the National Mall in Washington D.C., delighting government workers and tourists alike. In a stupendous blurring of fact and fiction, the Smithsonian National Portrait Gallery’s Director, Kim Sajet, played herself on the the Netflix show, House of Cards, to receive the “presidential” portrait of Francis J. Underwood into the collection. Painted by notable portrait artist, Jonathan Yeo, the painting is 6 feet by 6 feet and looms as large as Kevin Spacey’s depiction of the conniving and sinister Underwood. To complete the storyline, Underwood himself is quoted in the press release as saying, “I’m pleased that the Smithsonian continues to prove itself as a worthwhile institution. I’m one step closer to convincing the rest of the country that I am the President.” It give me shivers. How do you preserve African American history? One neighborhood at a time. The National Museum of African American History and Culture is visiting major cities around the country to help preserve family photographs and documents, military uniforms, quilts, and more with their Save Our African American Treasures program. The Smithsonian Institution Archives keeps collections related to the history of the Smithsonian; its people, buildings, and events. One such collection is the papers of Warren M. Robbins, the man behind the Museum of African Art that was transferred to the Smithsonian by Congress in 1978 (now the National Museum of African Art). The 109 boxes of correspondence, photos, and memorabilia were picked up from a Capitol Hill row house in 2011, and are a testament to Robbins’ passion for the African cultures that inspired him to found the museum. How does one collect an iPad app written for iOS 4.3? It was a challenge fitting to our National Design Museum, the Cooper Hewitt, who in 2013 added its first piece of software code to the collection. Learn more about how they are using open source methodologies to preserve this alternative music browser, Planetary, for generations to come. During the Iraq War, on September 17 and 18, 2004, American Indian members of the U.S. Army’s 120th Engineer Combat Battalion held an Inter-Tribal Powwow at Al Taqaddum Air Base in Iraq. For the Powwow, the soldiers fashioned a ceremonial drum from a 55-gallon oil drum that was cut in half and covered with canvas from a sleeping cot. 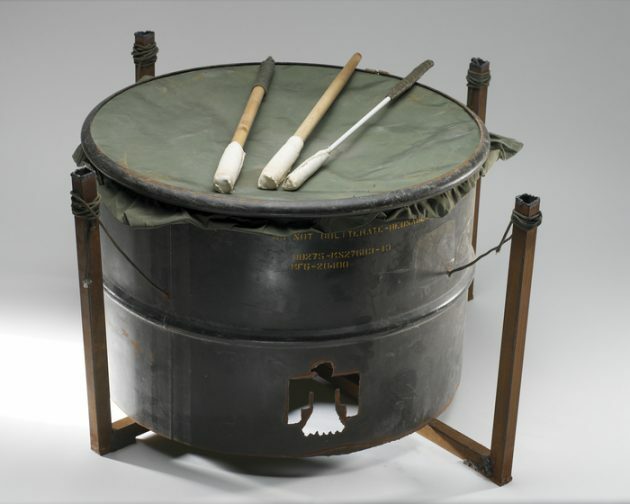 The drum was donated to our National Museum of American Indian by battalion members and their chaplain, Sergeant Debra K. Mooney (Choctaw), in 2005. Drum, stand, and drumsticks, 2004. Made by 120th Engineer Combat Battalion in Al Fallujah; Al Anbar Province; Iraq. National Museum of the American Indian. Finally, it’s only fitting to end with a unique look at one of the Smithsonian’s first treasures—our Castle. Though the Castle (which has housed exhibits, collections, and even our first Secretary!) was not completely finished until 1855, this photo was taken in the summer of 1850, while building was still underway. It is the earliest photo ever taken of the Smithsonian Castle, and the only photo of it under construction. And where did this rare photo come from? It was uncovered at a Washington D.C. Antique Photo and Postcard Show in the spring of 2015! 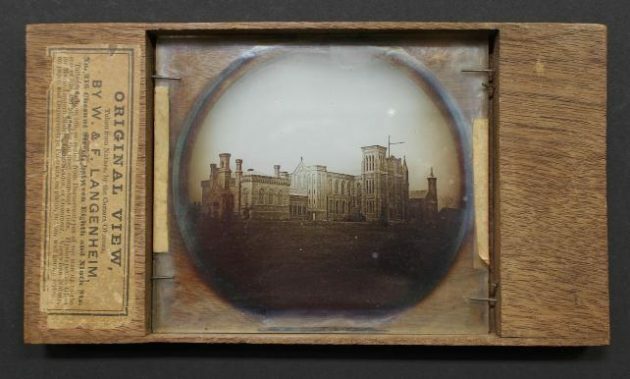 Lantern slide photograph on glass in wood mount, William Langenheim (1807-1874) and Frederick Langenheim (1809-1879) Philadelphia, 1850, Smithsonian Castle Collection, gift of Tom Rall, Arlington, Virginia. Want an extra birthday surprise? Head over to the Smithsonian Transcription Center, where you can see firsthand how museums like the National Air and Space Museum and the Smithsonian American Art Museum were organized (plus a look at the development of the Hope Diamond exhibition), and help transcribe!